You know what it means to be a fit bottomed girl (or guy). You realize you were put on this planet to do more than worry about your weight. And you’re pretty damn aware that dieting really, truly, seriously doesn’t work. You get it. You get us. But maybe you’re still not sure about just what it is you need to do. Knowing all of this is great, but taking tangible steps toward a healthier, happier future? Yeah, that’s next level. 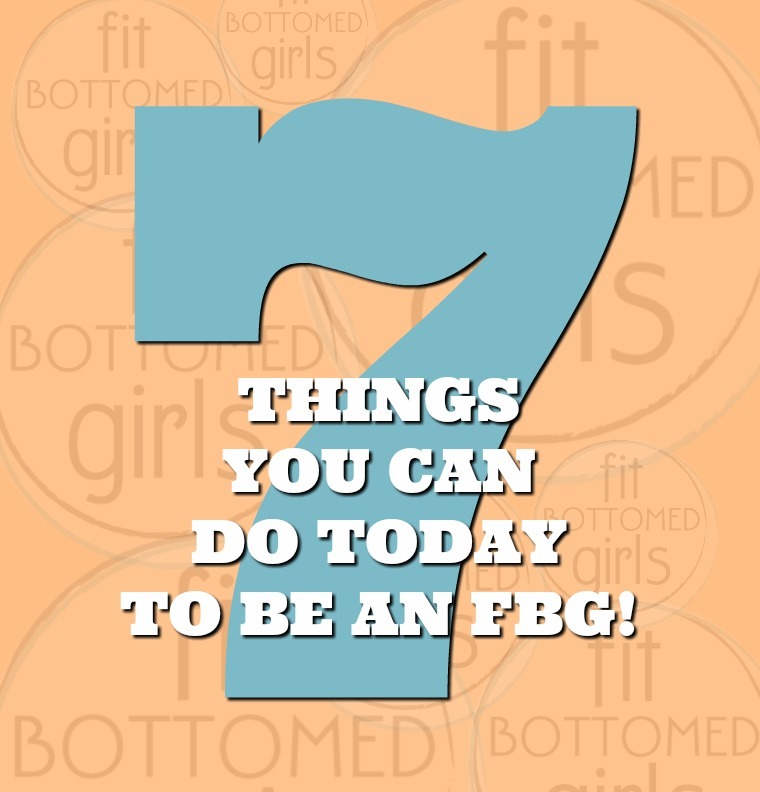 And we’re sharing seven things you can do — today — to become an FBG. Some are simple, some might take you a little bit outside your comfort zone, but the one thing they have in common is that they’ll all help you become an even more awesome version of yourself. The real reasons most of us have for wanting to be fitter, leaner, and healthier rarely have much to do with how we look. Not that liking what we see in the mirror isn’t a factor — because it is! But the truth is that when you love who you are, and you make healthy choices stemming from a place of self love (i.e. I’m going to the 6 a.m. bootcamp because I want to be strong and have more energy, versus I have to go to the 6 a.m. bootcamp because I ate pizza and need to work off those calories, plus my thighs rub and deserve to be punished), guess what? You’re far more likely to actually like what you see in the mirror — regardless of how that reflection actually looks. Finding your why requires some digging, and maybe a big of journaling, but once you find it, get ready for your game to change. Step 2: Figure out how you really want to feel. Once you’ve got your why, drill down deeper and think about how you want to feel. How do you want to feel when you look in the mirror? When you wake up in the morning? When you meet friends for coffee? When you play with your kids? When you give a presentation at work? When you make love? Then dig deep into what it would take to feel that way, like more effort at the gym, a cleaner way of eating, a keener focus on your mental health. This will help you set goals — and that why you just came up with will help you stay on track as you work toward them. Step 3: Show kindness … starting with yourself. When a negative thought pops in, (like, “I’m not fit enough to even run around the block,” or “I have no self control around cookies,) ask yourself if you can see things differently. Maybe you’re not ready to run around the block yet, but what can you do — and how does that compare to what you could do when you tried it the first time? Perhaps you had more cookies today than you would’ve liked, but empower yourself with the knowledge that a new slate starts now — and you truly deserve the effort it takes to make better choices. It’s about progress, not perfection, and each small step you take, every seemingly tiny good choice you make, all add up to awesome results down the road. Step 4: Then spread that message. The more you notice — and change your thinking around — negative self-talk, the more you’ll notice it when it comes up with friends. Instead of joining in when your friends start discussing things they dislike about themselves, jump in with positivity. What do you admire about them? Think beyond physicality, too, because although we can fixate on that when we’re on a fitness journey, we all know that there’s a lot more to each of us than a body. Speaking up can be scary, but seeing your friends come around and learn to love their own perceived faults is worth working through a bit of fear. Trust us on this one. Step 5: Honor — and listen to — your body. It’s one thing to push yourself to your limits, but it’s another to ignore the messages your body is trying to send. Nutrition and fitness don’t have one-size-fits-all labels, so while the high-protein eating plan your friend who loves CrossFit is following might be perfect for her, know that it might not give you the energy you need. Some people do really well with a diet higher in healthy fats, some folks process carbs well. There are athletes who live for the next ultramarathon, and there are plenty of yogis who’ve found health and joy on their mats. Find the healthy foods — and the activities — you love, see how your body responds, and adjust accordingly. Step 6: Befriend your fears. Step 7: Surround yourself with support. The people who love you want you to be healthy — but seeing a friend lose weight and become quite fit can bring up some tricky emotions, too. It’s important to have at least a couple of people in your corner when you’re committing to a healthier lifestyle for the long haul, not only because you’ll hit some obstacles as you get started, but also because, once you get near your goals, it can be easy to fall back into old habits and lose some of the progress you’ve made. The good news? This support doesn’t have to come from people you’re around in person — you can find it in loads of places. What great advice. I love these seven steps. I especially appreciate the advice to befriend my fears. I recently tried a new group workout. I was nervous, but went with a friend and loved it! I’ve become re-energized! The workout I tried was Orangetheory Fitness. It’s interval training using the treadmill, a rowing machine, and weights. These are such wonderful and important ideas that we should all be practicing. I have lately been trying to not complain and I cannot believe how many times I have had to stop myself from complaining. The worst part is the things I complain about the most are about myself. Looking for a positive thought to replace the negative one becomes a habit if you do it enough. The hard part is doing it and sticking with it. The hardest part is loving yourself as much as others love you. It’s a journey and I love these steps in that journey that you have outlined above. Bravo! Great insights! This article is full of lots of good inspirations and I am sure after following these 7 steps anyone can become an FBG. I have been regularly working out for approx. 3 years now. Has it been that long. It doesn`t seem like a work out, when it`s fun. I do Les Mill`s Body program. I went to Body Combat earlier – I really showed that fresh air who`s boss !! I`m going to Body Pump later. thank oyu for this …”figure out how you really want to feel.” actualt this make sense ..because that is major missing..thank you for the thoughts and keep sharing.. Surround yourself with support… but more importantly, accountability. If you put it out there and let others know the goal, you’re more motivated to not let yourself or them down!